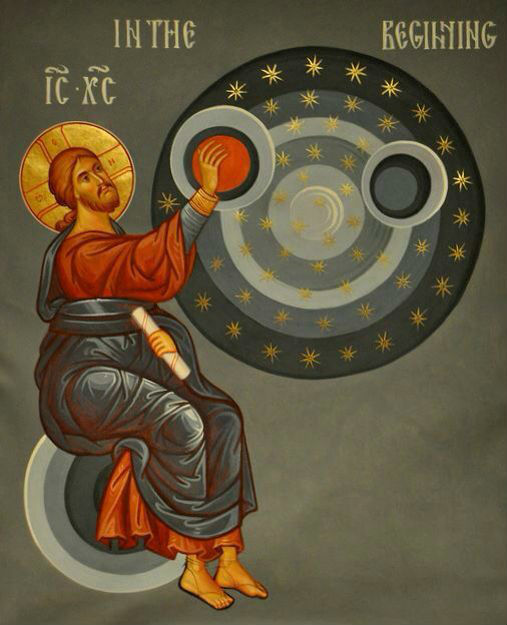 In the beginning, God created the universe, including humankind, whom He placed at the centre of creation*. He created us to live forever, without sickness, suffering, or death, and in perfect, ever-deepening communion with Him. But because the first parents of humankind, represented in the Holy Scriptures by Adam and Eve, chose to sin - to miss the mark of God's design for them - corruption and death entered into humankind. This is called "The Fall". And because humankind was chosen by God to act as the priest of creation - offering it up to God and then receiving it back as a means of blessing - creation also fell away from the harmonious peace that God had designed for it. This happened because God is the Giver of life and the Creator of order. So, when humankind cut itself off from God, death and chaos were introduced into humanity and, through us, into the rest of creation. Over time, as corruption and death touched everything humankind did, the world came to be ruled by violence and oppression. God began a process of revealing to humankind the way out of corruption, the way to reconnection with the life of God. He did this first through a man He chose especially for this task, Abraham, and then by giving a way of life to Abraham's descendants, who were first called Hebrews and then later, Jews. God spoke to this chosen people through the Prophet Moses and then through other prophets. To Moses, God revealed that He was to be known to the Hebrews as "Yahweh", which means "I am". This showed that the way of life He was revealing was intended to enable people to know Who God is, not just intellectually, but in a true and personal way. This way of life, revealed through Moses, had only one purpose: to teach the Hebrews and the nations around them how to get back into union with God so that they could truly know Him. And He showed Himself to Israel not only as their God, but also as their Father, which spoke of his desire for an intimate and close union. Over the centuries that followed Abraham and Moses, the nation of the Jews, called Israel, was sometimes faithful to God but often lost its way. About two thousand years ago, a young virgin named Mary, a descendant of David, the greatest of the kings of the Jews, was betrothed to an old, pious man named Joseph, also a descendant of David. Because of her purity of heart and her willingness to do as God asked her, she was chosen by God to give birth to the Son of God, Jesus Christ. She willingly assented to this pregnancy, which was announced to her by the Archangel Gabriel, and the One born of her was called Jesus, which means "Yahweh saves". Jesus was not the only the Son of the Father but was also God Himself, and He revealed that God is the Holy Trinity: Father, Son, and Holy Spirit - three divine Persons who share one essence: one God in three Persons. 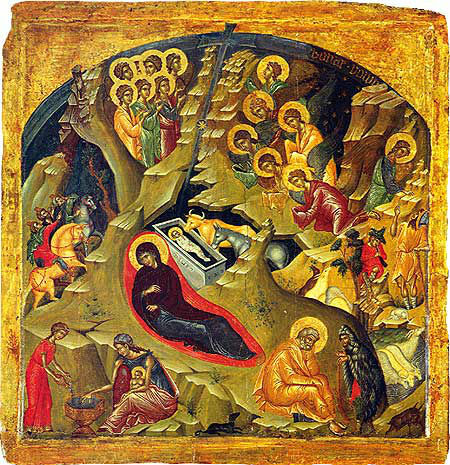 And when Jesus was conceived in Mary's womb - miraculously, without any earthly father - He Who had been fully God also became fully human, taking his humanity from her. Because of who Jesus was (and is) - both God and human - humankind has the possibility of being restored to full communion with God. Through his sharing in our humanity, we can access his divinity. The gap opened by Adam and Eve has been bridged. It is this that we celebrate each Christmas. During his ministry on earth, Jesus taught the people the way God wants us to live, healed them of their physical and spiritual sicknesses, and forgave them of their sins. He especially focused his ministry on twelve of his followers, or disciples, who were not members of the religious or intellectual classes but mostly fishermen. When his mission drew to a close, He was betrayed by Judas, one of the twelve, and was arrested by the Roman authorities. The Romans were acting on behalf of the religious leadership of the Jews, who saw Jesus as a threat to their established order. Although he had done nothing wrong, He was convicted as a blasphemer and was crucified - nailed to a large wooden cross to suffocate to death - by the Roman imperial government on behalf of the Jewish leaders. Jesus died on a Friday, the day before the greatest annual Jewish holy day, the Passover, a day that commemorated the delivery of the Hebrew people from slavery in Egypt. Jesus rose from the dead on the third day, Sunday. Through his voluntary death and Resurrection while possessing our humanity, Jesus broke the power of death over all humankind forever. After his Resurrection, He was seen alive by many, including the eleven disciples (Judas, in his remorse for betraying Christ, had meanwhile ended his own life) and many others. He spent another forty days on earth, further instructing his eleven disciples to form them into apostles, a word which means "those sent out on a mission". 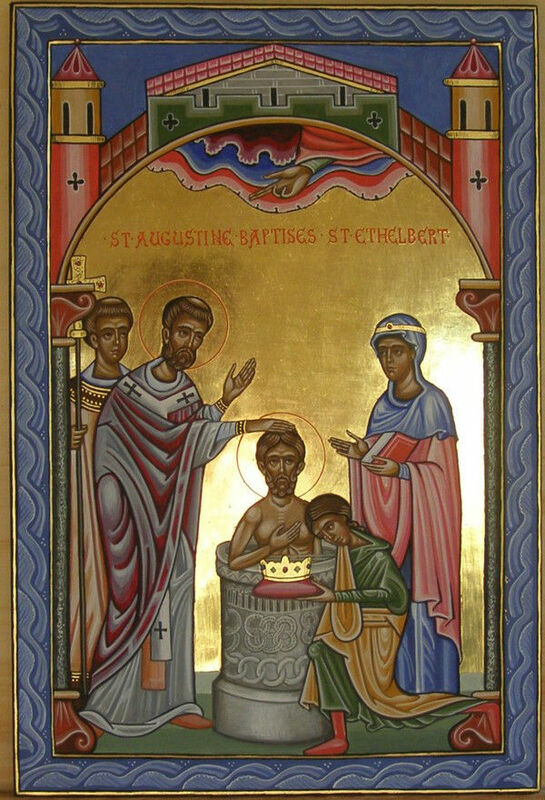 After these forty days, while still sharing our humanity, He physically returned to heaven, while the apostles watched. Thus the path was fully opened for humankind to share in the life of God. The apostles, following the instructions Jesus gave them, began to travel throughout the known world, preaching the Gospel everywhere, telling anyone who would listen the good news and baptising them into the name of the Father, and of the Son, and of the Holy Spirit. The good news is that, by repenting of our sins (turning away from all the ways we miss the perfect for which God has created us) and being baptised into membership of the Church - which Jesus Himself called his Body - it is possible for a person to conquer death, just as Jesus did through his sacrifice of Himself on the Cross. We can make the passage into death a passage into resurrection, because incorporation into the ongoing life of the Church is participation in Christ. This is what it means to be "saved". Someday, Jesus will return, and time as we know it will end. Everyone will be resurrected bodily at the end of time, but only those who are "in Christ" will experience that as a resurrection of eternal life with God. Those who reject Christ will still be raised to a resurrection in the eternal presence of God. However, as they have not accepted Christ's offer of union with God, this presence will be experienced by them as a continuation of existence cut off from the life that God so freely gives. Jesus, therefore, is the fulfilment, the full revelation of all that God began through Abraham and Moses, showing a way of life that made possible direct communion with God. The Church is therefore the fulfilment of the chosen community that was ancient Israel, a real community of people called to live together in harmony, communing with God and each other through the primary means God provided for his presence to be manifested among his people: the holy mysteries, also called sacraments. These sacraments include baptism, the Eucharist, marriage, and others. The apostles were the first to administer these mysteries in the Church. Part of their ministry was to ordain the next generation of Christian leaders as bishops. These bishops in turn ordained priests and deacons to help them with the work. As the Gospel spread throughout the world, new bishops were ordained by the apostles and their successors to lead the Church, which will continue its work until its fulfilment when Jesus returns at the end of time. Jesus founded only one Church to be his Body - not the multitude of Christian denominations we see in our own day, with various teachings and practices that have been introduced over time, many of which are not in keeping with the faith of the apostles. That continuous existence, that same Orthodox faith and practice was passed on from the apostles and their successors through all the centuries since the Resurrection of Christ, to the Orthodox bishops of today. Orthodox churches may go through periods of strained relations with each other, but these are ultimately temporary and do not supersede our shared faith and way of life. Orthodox Christians do not claim authority to make any pronouncements on the fate of those who believe and seek to follow Christ but who belong to groups that have broken away from this apostolic Tradition. We hold our arms out to them with great love and draw close to them where we have beliefs and practices in common, especially when we can work together for social and spiritual good. However, we only know that we must be faithful to what we have received from those before us, so that we may pass it on intact to those who come after us, to anyone who will hear and believe. These are the core beliefs of Orthodox Christianity, and we welcome you to explore them and claim them as your own. *The Orthodox Christian Tradition makes no definitive statement about exactly how God created the universe and how humankind came to be. Neither do we state a precise timescale for this. We state only that creation was the work of God, and that humankind was created in an undeveloped state, with the intention for us to grow and mature into life in God.